For those that have followed our blog, we are a married couple making plans for the full-time RV “nomadic” lifestyle. Although we been busy working the plan for our Great Escape in 2016, we are still living in a home that we rent, and we still have our small retail business. As we have started blogging, we follow other blogs and simply read even more blogs, all with the common thread of people who have chosen to be “nomads”. Of course, in our online “travels”, it has become obvious that there are differing levels of the nomadic lifestyle based on individual resources. Some are traveling full-time in a van or pick-up truck with camper or a tent trailer or even just a tent, while others are doing the same thing in a high dollar rig like a Prevost. And then there is the bulk of the rest of us in 5th wheels and motorhomes, all of us nomads or nomad wanabees. If you look up the definition of “nomad”, one definition is… “a member of a people having no permanent abode, and who travel from place to place…” Some synonyms for the word “nomad” include “travel”, wanderer” and “rover”. He was just walking along the edge of the road, leading his Mule Team. As I drove by, I commented to my wife that “I’ll bet THAT guy has a story to tell”. She said, “why don’t you drop me off at the shop and go back and find out?” So, I did. His name is “Mule”. And he’s been on the road and living outdoors for decades. The other “mules” are “Lady” and “Little Girl”. Apparently, they have become fairly famous in the West, although I did not know that when we met. We talked for most of an hour, just me and the three mules. After just a few moments, it became clear to me that “Mule” was not just a nomad. He is a road warrior. A man on a mission. But before getting into that, let me tell you that he has been on the road for 31 of his 67 years. And the other mules have been with him for most of that time. Apparently, mules live long lives. One was in her 20s and the other was 40 something. 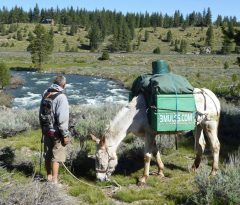 Mule was born and raised in the San Francisco but during his life on the road, he has traveled throughout the west and as far east as Arkansas. I asked him if he ever rides the other mules. He said he used to have a third mule, “Pepper” but it came up lame, so he gave it to a good home. Now, he just walks. And walks, and walks. Generally, 15-20 miles per day. As I alluded to earlier, Mule is a man on a mission. He travels the West calling attention to and otherwise alerting folks to out of control urban sprawl which he firmly believes is ruining “the beautiful earth”. Particularly stuck in his craw, is California Penal Code 647(e) which, among other things, makes lying down and sleeping pretty much ANYWHERE, an offense for disorderly conduct. Because that is exactly what he does nightly, he has been arrested in many, many jurisdictions throughout California. This has, in nearly every case, led to charges having been dropped, but often times not before he is arrested and his mules hauled off to Animal Control, for which he has to pay to retrieve them. He firmly believes that what we have, what he and other nomadic lifestyle individuals treasure, will eventually disappear, the wide open and free Great Outdoors. He is convinced that the establishment is working to insure that this will happen in the name of “progress”. Maybe sooner than later. Interestingly, at the end of our conversation he said “Can I ask YOU a question?” “Can you tell me where the local City Hall is?” I gave him directions and wondered if, being the activist that he is, he’d be sleeping outside City Hall tonight…or INSIDE next door at the police station.